This name indicates a British rank of nobility (in the Middle Ages frequently used as an equivalent of the Norman Count). However, it must be said that rarely if ever were the original namebearers also holders of the rank in question. Noble names for example King, Baron, Knight, Earl etc., were originally given as a nickname either to one who played such a part in a medieval play or pageant, or to a servant employed in a noble household. This name derives from the Old English pre 7th Century "eorl" meaning "earl" and is first recorded towards the end of the 11th Century (see below). On December 22nd 1679, one Thomas Earl is listed as a landholder in the parish of Christchurch, Barbados. 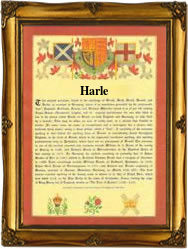 In the modern idiom the name has ten spelling variations including Earl(e), Hurl(l), Harle, Hearl(e) and Hurle(s). The first recorded spelling of the family name is shown to be that of Lefuin Eorl, which was dated 1095, in the "Records of the Abbey of Bury St. Edmunds", during the reign of King William 11, known as "Rufus", 1087 - 1100. Surnames became necessary when governments introduced personal taxation. In England this was known as Poll Tax. Throughout the centuries, surnames in every country have continued to "develop" often leading to astonishing variants of the original spelling.